Hollywood may be the place where stars are born, but before making it, the standout individuals have to come from somewhere. South Philly has certainly produced its share of famous faces, including actors, singers, directors and athletes, too. Over my close to two decades in various positions at the South Philly Review, I’ve had the chance to interview and meet many of them. I will never forget that night with Al Martino. The day after the story ran in the South Philly Review, I went to Atlantic City, N.J., to see him perform at the Resorts Superstar Theater. Little did I know at the time that he would be pulling a beautiful woman sitting in the front row on stage to dance. Yep, she was with me, and eventually became my wife (who was a few days removed from knee surgery). We introduced ourselves at the meet and greet, at which point Martino noticed his dance partner was walking around with a cane. It’s a story we still laugh about today. It’s also hard to forget being put in a headlock by former ECW wrestler The Blue Meanie in the middle of the old South Philly Review conference room. He stopped in for a lifestyles interview with one of my co-workers. The quick greeting turned into a quick intro to pro wrestling 101. At least I did not get hit across the back with a chair or kendo stick! No injuries occurred during the photo-op (come on people, wrestling is fake). Then there was the time we surprised a South Philly resident. James Darren stopped by the office on his way down to AC, and we decided to take a stroll to his former home. The surprise visit created one of those “OMG” moments, predating the social media and texting society we reside in today. 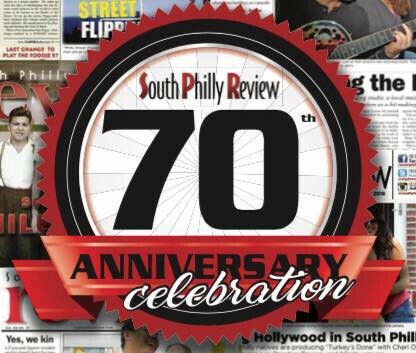 I can go on and on about these memorable stories, but it’s time to shine the spotlight EXACTLY where it belongs — the 70th anniversary of the South Philly Review. In the process of putting this week’s issue together, I took a moment to flip through the old 50th anniversary edition from 1997. Yep, it was a whopper — 172 pages thick. The classic with its glossy cover pages still generates that “WOW!” reaction two decades later. The issue predated the news-available-at-our fingertips era that we reside in today. With 70 being a biggie, it’s only fitting that the number is incorporated in some way into this week’s theme. This week’s issue highlights some of the biggies to make it out of the neighborhood — including Hall of Famers and other legends. This group represents a small sampling of those who have filled the pages of the South Philly Review over the past six decades. Just like our 50th, we will be celebrating our 70th with a big South Philly-style bash. We are talking cheesesteaks, roast pork, pasta (with gravy) and more. The party is taking place tonight at Galdo’s, 1933 W. Moyamensing Ave., from 5 to 9 p.m. Tickets are $15 in advance and $20 at the door. There will be a cash bar. Visit nmg.ticketleap.com/70th to purchase tickets. Until then, sit back and read about some South Philadelphians who have taken some star-studded steps.